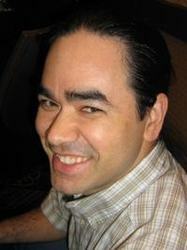 Doug Smith is an accomplished freelance artist and voice actor who has performed many roles for ADV and FUNimation, including the lead, Kintaro Oe, in "Goldenboy". One of his lesser known but more powerful roles that of Squeebo, the poor blind orphan in the OVA series "Splendid Eyeball Gremulak", which, unfortunately for fans everywhere, doesn't actually exist. Doug is a man of adventure, traveling the country and globe, working to hone his artistic skills and always in search of the elusive American Dream. There's no place he won't go, the jungle, desert, the highest mountain peaks, the depths of the ocean and the silent void of outer space to reach that elusive dream. His artwork has been used for CD album covers, magazines, comics, posters, anime con program guides and badges, exorcisms, DVDs and TV. Doug is also the Art Director for non-profit Voices For, an organization which works with talented people in the anime/manga industry to create products, the profits of which are donated to charity.